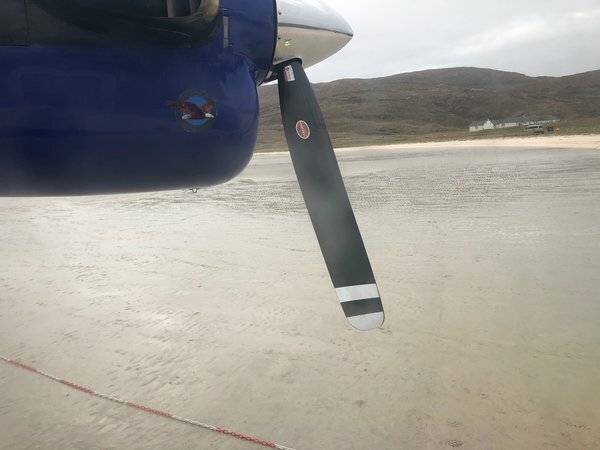 This is part two of my review of my trip to Barra in the Outer Hebrides, flying with Loganair. 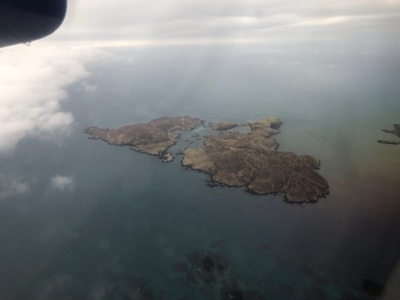 Why did I fly to an island in the Outer Hebrides with a population of 1,100? Because it is the only place in the world with a scheduled flight which lands on a beach. And who wouldn’t want to try that? 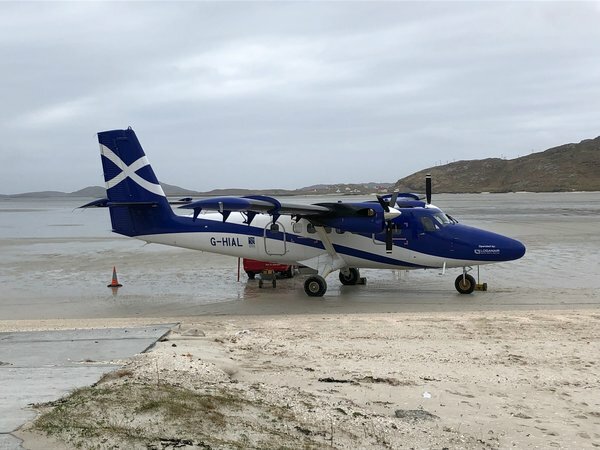 Part one of this review, covering my flight to Barra, is here. I didn’t get a photograph of the cafe counter, which was a mistake. The cafe is excellent. I had a plate of scampi and chips, all cooked to order, for £8. If I had a cafe like this on my street I would be in there all the time! Once I had arrived, all of the cafe customers got up to board the plane for its return trip to Glasgow so I had it virtually to myself. 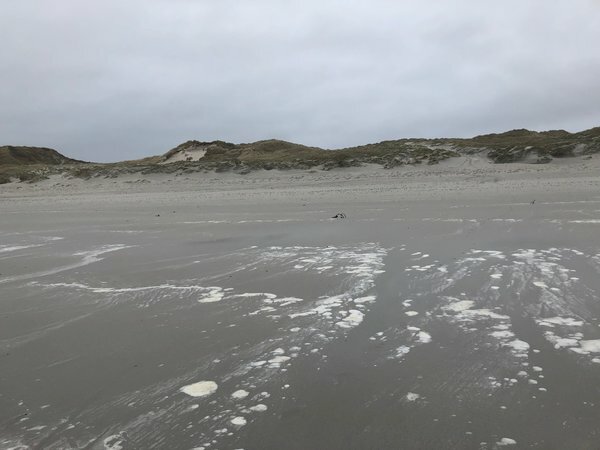 I was utterly, totally alone on a huge beach, on a very cloudy and cold April day. It was great. When I arrived back at the terminal, my return flight was coming in to land. I was lucky and caught it on video. 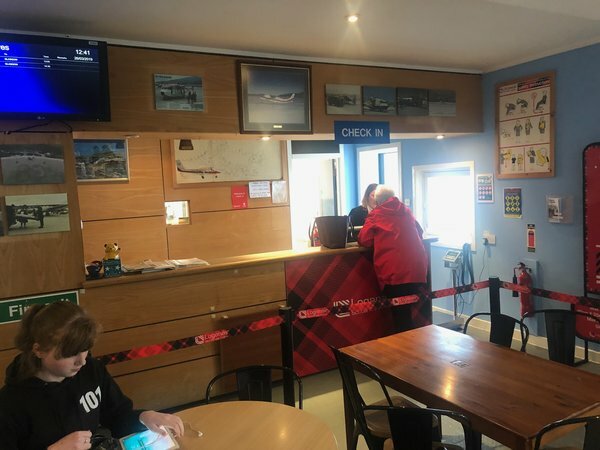 There is no security at Barra. Well, there is a door marked ‘Security’ you walk through but that is about it! I had Seat 2A on the return, another solo seat. 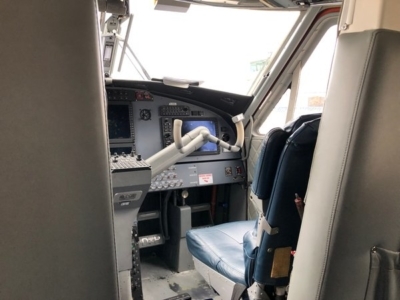 This is one of the best seats for being able to see into the cockpit during the flight – don’t take 1A as you are too close to the bulkhead to see in. The video shows the take-off. Around an hour later we landed back in Glasgow, directly on schedule. If you’re interested in aviation then I thoroughly recommend the flight to Barra. You may want to stay a bit longer than I did, especially if you go during the Summer, but the quick turnaround worked well for me. If you pick your dates properly (remember the flight times change with the tide times) it is even possible as a day trip from London. Four flights in a day seemed a bit excessive to me so I stayed overnight in Glasgow, a city I have rarely visited. I shot quite a lot of video during my flights including the landing and take off from the beach – click the image below to view it. At 7 minutes, it is longer than our usual videos but well worth it, and we didn’t put the usual music on this time! If you can’t see it, click here to visit the Head for Points YouTube page. You can also subscribe to our channel via that link. Am I correct that you cannot use Avios to fly anywhere in Scotland from Scotland? Only Scotland to London or occasionally further afield? I stand corrected, but the only Avios partner was FlyBe and that’s now ended. Loganair have their own loyalty scheme that is called Clan Loganair and as far as I know, do not partner with Avios. I booked Flybe on ba.com using Avios a few days ago for travel this summer so it still seems possible to book using Avios until their partnership officially ends. Flybe still bookable until 30th April but this route is no longer a Flybe franchise. Really? I was trying to book, without success. I was looking at DUS to LBA or MAN. Maybe the system was down when I was looking, a couple of weeks back. That looks lovely! Some of the beaches in the Hebrides are just stunning (Harris and Iona are the best I’ve come across so far). They don’t quite come with the weather you get in the Seychelles, but the views are glorious! I may need to take this trip one day! 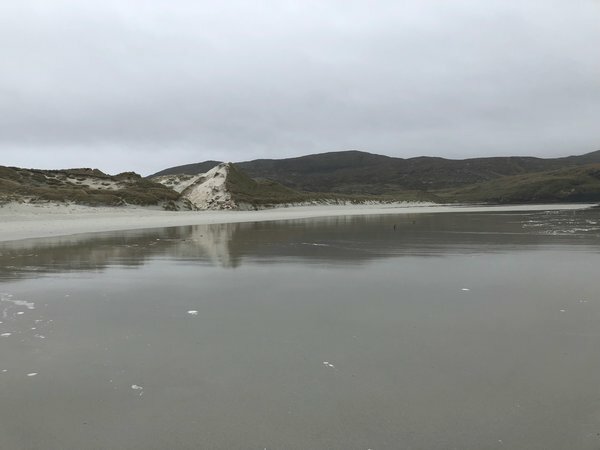 Scarista & Luskentyre are among the best beaches I’ve ever been. Water temperature just about swimable in summer – but you do need to swim to keep warm. I went in for a dip on Iona in October. Rob – Thanks for sharing that trip. A really interesting article. Rob – great video and great to see you got some authentic weather! I ate at that cafe after a tour of the island (you would have had time! for a tour!, and it was great, far better than what i was expecting. Sitting eating whilst watching your plane pull up in front of you was a unique experience. The airport did at one point have a security guard, but he tried to stop someone from taking eggs on board a flight and was never allowed to live it down (or so the story goes). I have heard the same story about Stornoway in Lewis so it sounds like a rural myth!! I’ve not seen the video yet as in the office without headphones so I don’t know if you mention it there but what is the landing experience like in Glasgow? I’m sure I read somewhere that you don’t follow the normal domestic arrivals path due to not having passed through security. Through checking of bags is not permitted either. That said I’m sure at one time this wasn’t the case and it used to be treated as any normal domestic flight. So perhaps there used to be security at this airport but was removed due to low risk (as I think aircraft under a certain capacity are exempt). I’m not sure how it is meant to work in Glasgow. However … I was basically forced to leave the airside area even though I had a connecting flight. There was no way of remaining airside. I ended up having to go back up to departures and go back through security. Arguably this could be to do with the lack of security in Barra. Sounds like how I heard it was supposed to work. Well, I gave up my busy city life for a peaceful one in the Outer Hebrides years ago, and I have never regretted it. 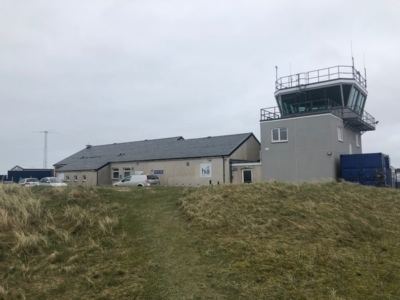 While travelling abroad is a bit of a pain for an Avios collector (having to fly to Glasgow, Inverness or Edinburgh first and then to London and further), airport parking is free – in fact, I can even walk to our airport – and air pollution as well as stress levels are famously low in the islands. What annoys me though is the restricted baggage allowance, which wasn’t really a problem until recently. We like doing some shopping while on holidays and would always make the most of it in terms of luggage, travelling in BAs premium cabins, but now BA states during the booking process that the allowance is just one bag at 23kg. Before that, the BA staff members at check-in in Heathrow or abroad would just override the restriction and check all our bags through to the island. You obviously enjoyed your quick visit to Barra, but somewhere, maybe it needs mentioning that this is a ‘lifeline’ flight for islanders and their visiting family, not just a ‘bucket list ‘ flight. 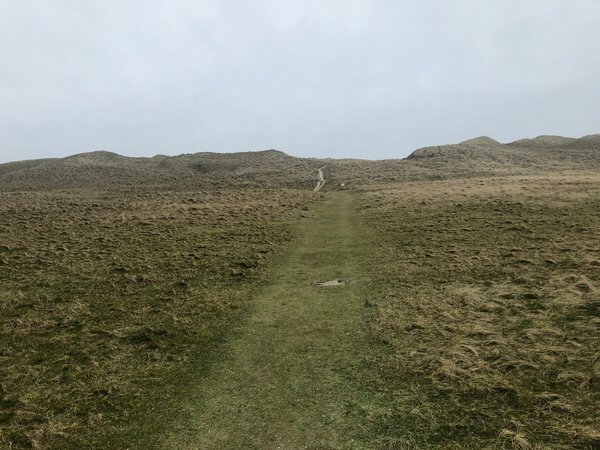 March / April is NOT the best time to visit Barra, though. 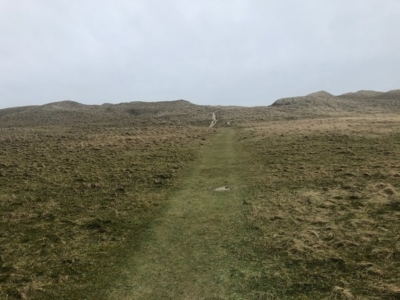 While Rob mentions the beaches – the sandy one are all up the west coast, while the east coast is dramatic and rocky, and also worth seeing, the unique sight in the Hebrides is when the machair blooms – that is the grass just before the sand itself. Late spring / early summer as I recall. While living on the island I also remember thinking that with clever camera angles and a few potted palms you could forget about going to the Caribbean or the Seychelles for fashion shoots, though you would have a problem waiting for the one really sunny day – and the wind free day too.